The Executives’ Association of New York City (EANYC), in partnership with SmartCEO, celebrated the 2016 Deals of Distinction Award honorees on Thursday, May 19 at Capitale. The Deals of Distinction program recognizes the area’s most accomplished executives and the transactions and partnerships that have made their organizations thrive. This year’s honorees collectively generate $3.17 billion in annual revenue and employ more than 9,600 individuals. More than 450 executives, friends and family attended the black-tie-optional event to celebrate the honorees and their achievements. The evening kicked off with a VIP party for finalists and sponsors and a cocktail hour with high-level networking. The awards ceremony opened with high-energy music and a video presentation that told each finalist’s story. In all, awards were given in 15 categories. 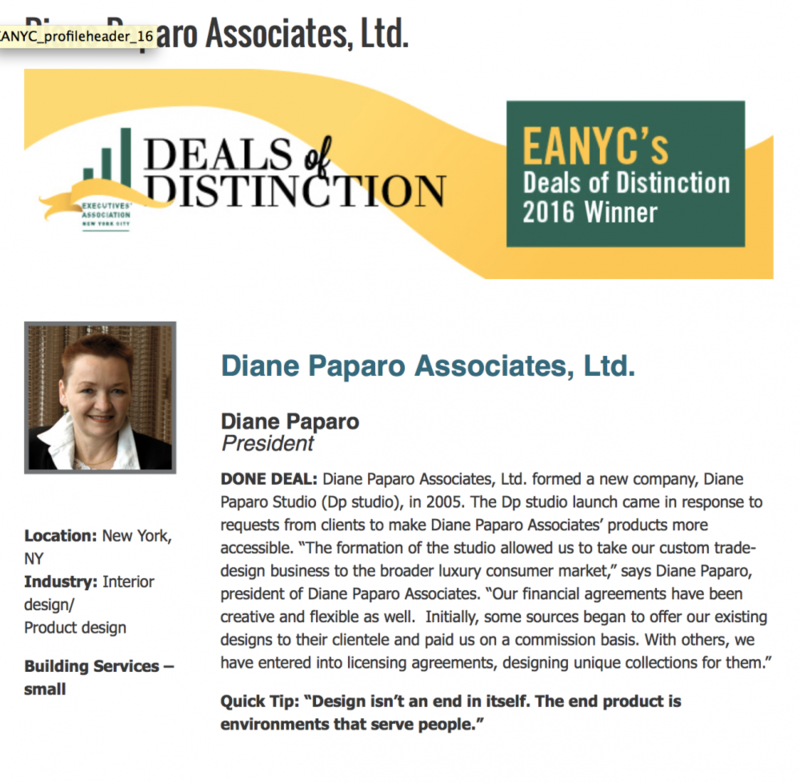 Diane Paparo Associates, Ltd. came home a winner in the Building Services (Small) Category. Diane was called to the stage and gave a short speech about the lasting impact of her deal of distinction. The 2016 Executives’ Association of New York City Deals of Distinction program honors innovative business leaders and dealmakers from the Greater New York City region who have a unique story to tell about a business transaction and/or partnership that made a significant impact on the company and its success. Finalists and winners were chosen by an independent panel of local business leaders and assessed based on the details of their deal/partnership, and how it positively affected the organizations involved, the industry or the business community as a whole. The Executives’ Association of New York City is comprised of leading businesses represented by their owners or principal senior executives. Every member company, admitted only after careful qualification, is the exclusive representative of its specific business category. Members come from all business sectors, including service industries, professions, trades, manufacturing, and associations. Executives’ Association member representatives work to expand business opportunities for each other by meeting weekly to share worthwhile business information and to arrange introductions to key individuals at companies where members would like to do business. The Executives’ Association tries to aid each member firm in growing its business locally, nationally and internationally, in line with its own growth objectives. The Executives’ Association openly welcomes all companies as prospective members, including woman-owned and minority-owned enterprises. SmartCEO’s mission is to educate and inspire the business community through its award- winning magazine, connections at C-level events and access to valuable online resources. SmartCEO’s integrated media platforms reach decision makers in the Baltimore, New York, Philadelphia and Washington, DC, metropolitan areas. New Location on Park Avenue!